Come up the mountain and let our friendly and dedicated team serve you a delicious meal in our rustic log restaurant. Hours vary by season. Call our Front Desk to confirm hours. 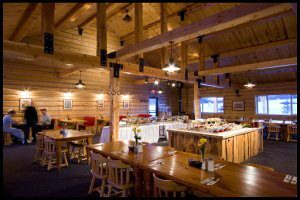 You will enjoy the great food and atmosphere of the log dining room and the mountain splendor just outside the windows. In the Summer and Fall seasons, it is easy to see why the Lodge is called "Elk View" Inn. Restaurant Hours vary by season.